Maison Pitchiline - What is a Pitchiline ? And what's a Pitchiline ? 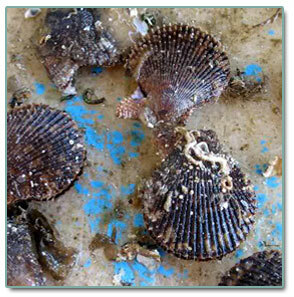 Actually the name is “pichiline”; the very local name of a shell, looking like a small scallop. By the time here were plenty of them in the lagoon, but victims of their popularity they’ve nearly disappeared by now. In the 5th century the Romance geographer Rufus Festus Avienus wrote in “Ora maritima” about a place called “Polygium” - Bouzigues - which was a “poor and small barbarian village”. Bouzigues had habitants since Neolithic, but since Bronze-age the village has been inhabited on a permanent basis. Five centuries B.C., Greeks had already connected existing roads in the Mediterranean part of Gaul to form a continuous axis; Via Herculea, passing through the hills behind Bouzigues. The road was then modernized and remodeled by the Romans towards 121-118 B.C. and baptized Via Domitia, but before the roman colonization the road had seen Hannibal passing with his elephants in 218 B.C. on his way to Rome (second Punic War). An amusing detail is that Greek roads passed by existing Celtic villages, whereas Romans preferred to pass just aside to avoid being attacked by “urban guerrillas”! Roman dwellings and cities were built on parallel sections.